It's great to see who's signing up for your events, but do they actually attend? Or, have you ever wanted to take an impromptu register of attendance at one of your events, but then the moment passes? Event check-in will help you. Event overseers can access and initiate an event check-in session from within ChurchSuite, or My ChurchSuite, perhaps using their smart phone or tablet. They can even authorise additional check-in devices to enable others to help with check-in for large events. Check-in runs in real time, so a check-in recorded on one device is immediately known on the other devices. Where there has been event sign-up and an email confirmation issued, event check-in can be done using QR code scanning through My ChurchSuite within our iOS and Android apps - a unique QR code is automatically incorporated into the sign-up confirmation email. Sign-ups can also present the QR code available on their phone for events they've signed-up for. As an alternative to QR-scanning, you can also view and tick a register of your sign-ups. By using the contact search options, you can search for and check-in non-signups. You can restrict contact search to the Address Book, Children module, or the event tag. When selecting a contact or sign-up from the list, an optional check-in confirmation message displays all the event sign-up details, including tickets, payments and event question responses; making "pay on the door" really easy to administer. You can check-in a person by clicking "Check-in" on the pop-up confirmation (see below), or you can disable the pop-up confirmation and simply tick against the person's name in the list. If you have "Pay on arrival" tickets for the event or you have unpaid or partial-paid tickets, there's an option to process the payment made on arrival, marking the ticket as "Paid" - this updates back in your event within the Calendar module. All the check-in data (who, when and by whom) pulls back through to ChurchSuite and can be clearly seen against each event. The same event management features for "sign-ups" are also provided for "check-ins"; so you can easily communicate with checked in contacts after an event, or perhaps record a Key Date, assign a Tag or add them to one of your Flows. You can optionally filter your communications, perhaps communicating differently between contacts in your Address Book and/or Children module, or those check-ins "Not in ChurchSuite". And for events that are set as "Sign up to sequence" - like an Alpha course, where people sign-up once to the entire course sequence of dates - you can run check-in for each date in the sequence. The sequence check-in data then builds into a helpful table of attendance. From there you can filter your communications based on attendance, perhaps to those who attended more than one date in the sequence, or those who attended all dates, or just those who attended on certain dates. Note that Event check-in operates independently to "sign-up" - therefore, for "pay" events, delegates should first be directed to the event sign-up page in order to sign-up, pay, and/or answer any event sign-up questions you have set. 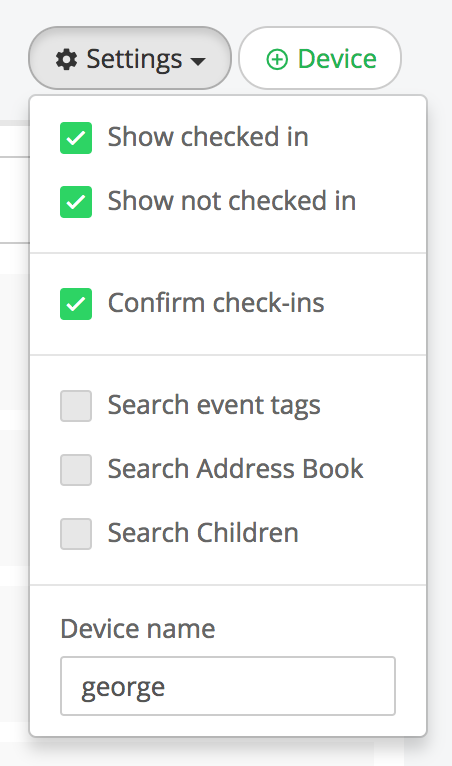 In the meantime you can still process their event check-in using the Address Book/Children/Event Tag "search" option. Check-in works for recurring, multi-date events too! Whether your recurring event dates are each individual events (like a newcomer dinner), or part of a sequence (like a discipleship course), you can easily record check-in attendance. Note that it is not possible to check people out, however it is possible to delete a check-in attendance record. For "on the door" events, it is only possible to record a check-in for contacts that exist in your Address Book or Children module. However, for "sign-up" events where non-ChurchSuite contacts may have signed up, check-in can be used to check them in. Overseers can access and use any event's check-in page from the point that the event is created in the Calendar module, up to the point that check-in closes. Check-in closes and is locked off seven days after the event end time. From the Calendar module, navigate to an event and select "Go to event check-in". ...or from within My ChurchSuite, event overseers can select "Check-In". Whether working within a web browser environment, or from within our iOS or Android apps, the same check-in page is launched. Configure any optional settings (drop-down menu options shown below), perhaps choosing whether or not to show names after they are checked in (i.e. a diminishing list), and whether to optionally show or hide the on-screen check-in confirmation, which includes details of tickets, payments and event question responses. 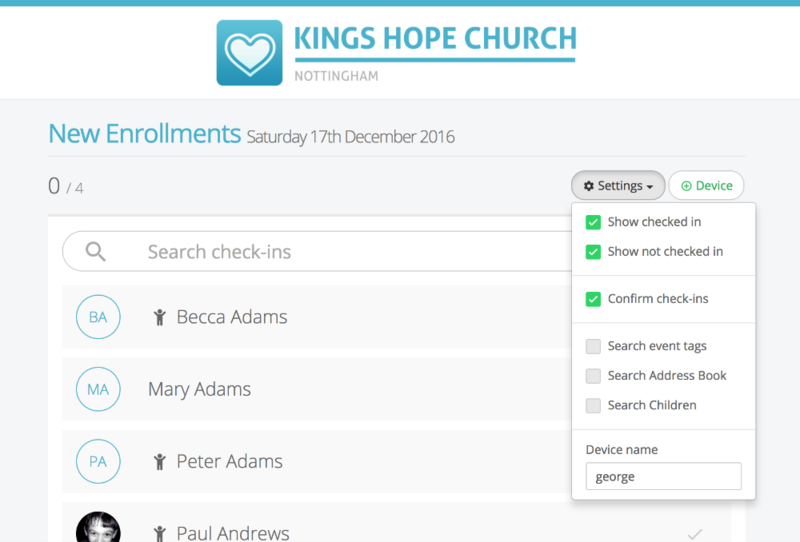 For events where you need to check in ChurchSuite contacts that have not previously signed up, you can enabled "Contact Search", choosing whether to search within the Address Book or Children module, or both. Additionally, if your event visibility has been restricted to one or more Tags (e.g. a Leader's event just visible to those in your Leader Tag), you can select the option to "Search event tags", which will give you a more intuitive list of possible contacts based on who the event was originally made visible to. You can now begin ticking names from the list (or unticking, to cancel a check-in). For sign-up events, your sign-ups are listed first. Note that you can also search the Address Book and Children module by enabling those search options in the Settings. Then you can either scroll to navigate to a contact, or you can use the "Search check-ins" box, which will auto-filter the list as you begin to type. A date and time stamp is recorded for the attendee against your event in ChurchSuite. Further check-in devices can be authorised by overseers from within My ChurchSuite. This can be helpful when you need a helper to assist with your event check-in at busy events. Helpers can have their device authorised without the needing to be added as overseers. Any device with a camera, an installed third-party QR Scanner app, and internet access can be used. They will use their third-party scanner app, rather than My ChurchSuite to scan QR codes of event sign-ups. Overseers begin the process of authorising a device on the event page within My ChurchSuite; clicking the "Device" button to display a QR code and secure PIN number. 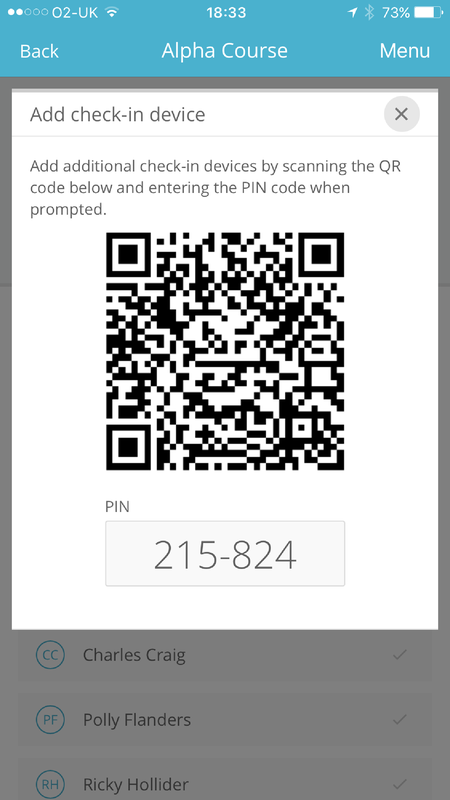 Other devices can either scan the overseer's QR code directly (no PIN is then required), or they can scan the QR code of any event sign-up/delegate, which will open the check-in page and request the authentication PIN (this PIN is only required when the first check-in QR code is scanned, not for subsequent check-ins). There's no limit to the number of concurrent check-in devices that can be used. Each check-in device can be named - the device name is included with the check-in attendance entry so you can see who checked in whom. When a new device is first authorised using either method above, the check-in page opens within the device's browser. An authorised device can either be used to manually tick off check-ins on the check-in page, or the user can switch back to their device's third-party QR Code scanner app and resume scanning in event delegates. Note that each scan will return them to the event check-in page to log the check-in entry, after which they must switch back again to their QR Scanner app in order to scan the next QR code. 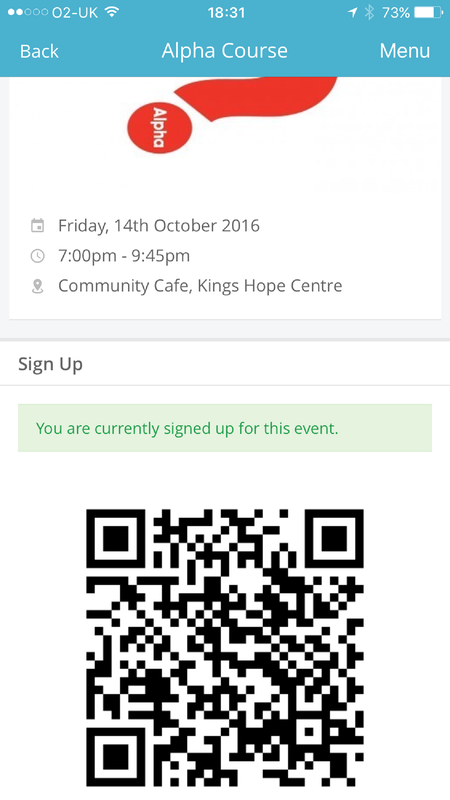 Note that the "Scan QR Code" button on the event page is only visible to overseers within My ChurchSuite. 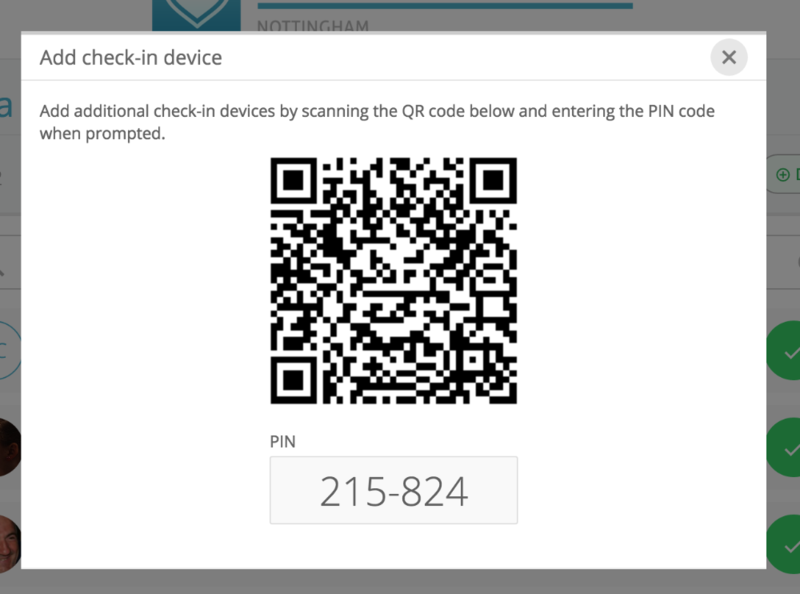 The "Scan QR Code" button is not visible on the event check-in page that additional authorised devices see when the check-in page opens in their device browser. Therefore, additional devices must use a third-party QR Code Scanner app. Back in ChurchSuite, the event page will now have a new "Check-Ins" tab (only visible when there has been one or more check-ins). For single date events (i.e. those not set to "sign up to sequence"), the check-in tab displays a list of all the check-in attendance records. From here you can communicate with, download and print reports of your check-in attendees, or perhaps assign them to Flows, Key Dates or Tags (only for check-ins that exist in your ChurchSuite database). The "Reload check-ins" button refreshes the check-in data in real time - perhaps if you are viewing the event page during check-in itself. For events that are set as "Sign up to the sequence", the check-in data for each event date in the sequence will build into an attendance table, making it easy to see who was present at which events in the sequence and who was missing. Sequence event "% Attendance to date" is also shown - in the example below, David Andrews has been to 42% of the events within the sequence between 6th January and 31st March. 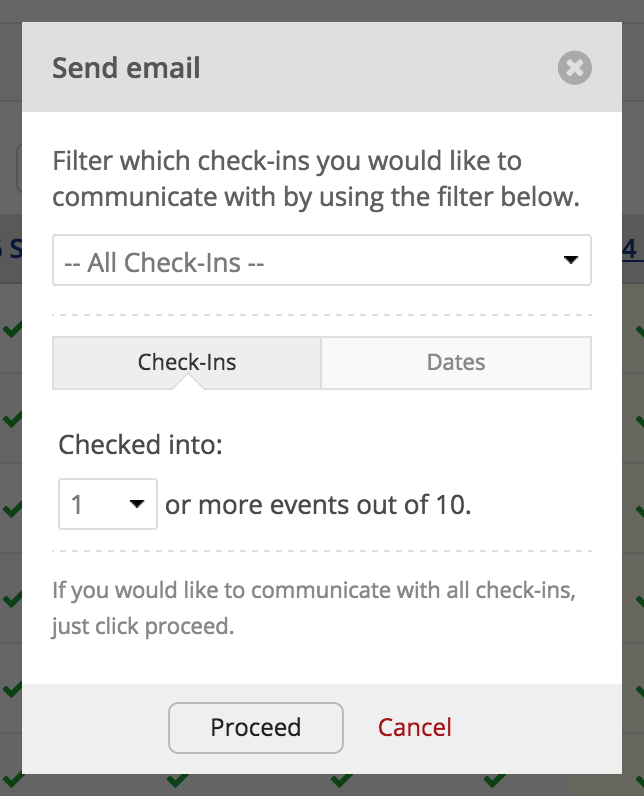 When communicating with checked in attendees for "sequence sign-up" events, you have additional communication filtering options, enabling you to reach out to just certain groups of attendees - perhaps those in your Address Book and/or Children module, or those not in ChurchSuite at all. You can filter communications to those who have attended X or more events in the sequence; or those who have attended on specific dates in the sequence. 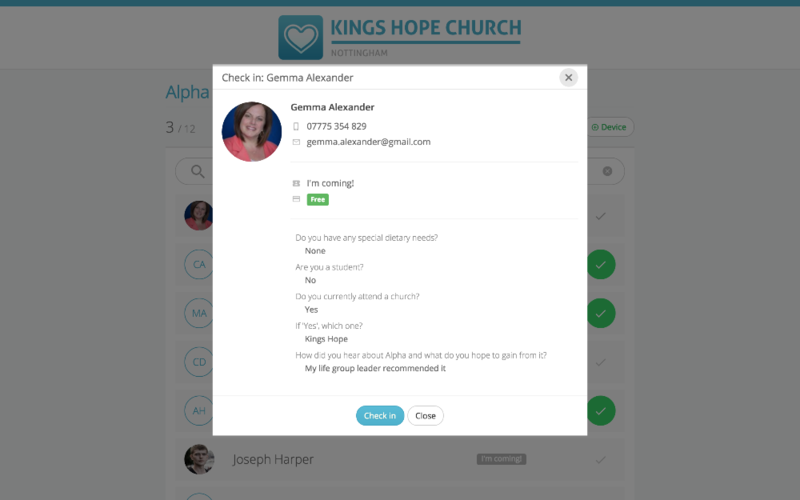 It is possible to return to the Check-In session page for up to seven days after the end time of an event, enabling churches to use check-in both at an event, or after an event if they wish. Once check-in is locked, it is not possible to record further check-in attendance.